Many a time, you might have found yourself thinking that grammar and syntax are one and the same. Most people think so, and unless you are having a deep study on the two or either, you might never realize that they are different. However, there are thin lines separating them that unless you are keenly interested in getting them, you might never know the variance. Grammar and syntax are different. They are two disciplines that overlap each other as they are both useful in the construction of sentences, phrases, as well as words in any language. They both deal with the rules and structures governing a language which makes most people conclude that they refer to the same concepts. However, this assumption can never be true and depending on the need that you have to know their separation line you can get the different variations from several perspectives. Grammar can be defined as the whole system and structure that a language is based on and usually consists of syntax and morphology. Sometimes it is also taken as consisting of phonology and semantics. Grammar also refers to a set structure of rules that governs how sentences, clauses, words, and phrases in a language are constructed. Grammar in a broader examination studies word classes, their functions, inflections, and relations in a particular sentence. Other aspects like accidence, that is, the inflection of words, orthography referring to spellings, and syntax, referring to the structure of sentences also fall under the grammar category. Grammar can be either perspective or descriptive. 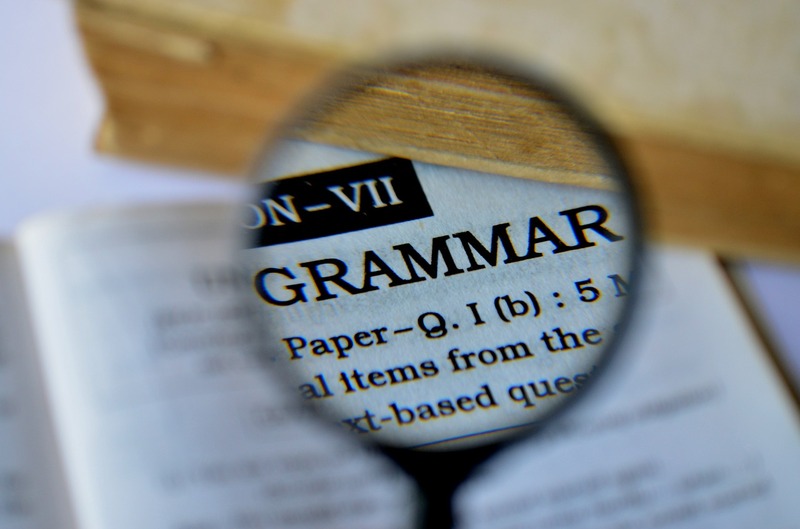 Perspective grammar, on the one hand, stipulates or prescribes how the users should use a language structure while descriptive grammar, on the other hand, describes how its speakers and writers use a language’s structure. Grammar rules and structures are varied. Their variances are based on the different languages available. For instance, the English language follows the structure of a subject, verb, object while the Hindi language follows a subject, object, verb pattern. Syntax is defined as the arrangement of words and phrases in a language to create a well-structured or well-formed sentence. It can also be described as a field of linguistics studying the structure of a sentence. It also studies the set of principles, rules, and processes governing the structure of sentences in any language. It is an important discipline of linguistics since the meaning of a sentence can change depending on its structure. The word order in a phrase or sentence, therefore, becomes important in realizing the formation of that sentence. Syntax basically studies sentences drawing a clear inner division between the different parts of the sentence. A sentence is divided into two major parts. The parts are the subject and a predicate. Syntax is descriptive (that is, it only observes the rules) whereas grammar is prescriptive (it is strict on how they should be used and provides guidance). Grammar is the rule of a language while syntax is the rule governing word order. Grammar is a more general linguistic term and is applied in everyday usage. Syntax, on the other hand, is a discipline of linguistics. Although the difference between grammar and syntax is like an engine and a car, it is not every person’s cup of water. It is not an easy task differentiating them, especially because most people have not come across any task that requires their prowess in, for example, syntax. With the proper grammatical rules at play, however, you can make your way through anything. However, for scholars, the terms become of higher interest as well as how their differences are arrived at. Sarah Brown. "Difference Between Grammar and Syntax." DifferenceBetween.net. October 4, 2018 < http://www.differencebetween.net/language/difference-between-grammar-and-syntax/ >. 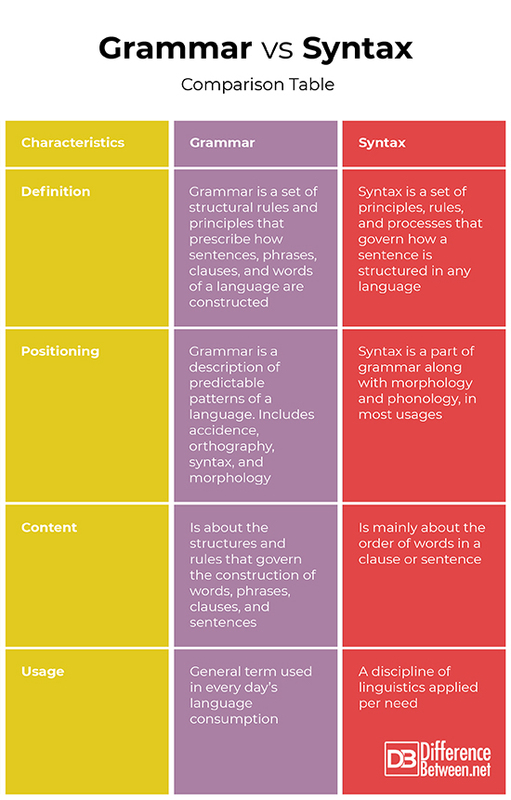 "Syntax VS Grammar (The Differences And Similarities)". Melvasarisimangunsong, 2018, https://melvasarisimangunsong.wordpress.com/2014/01/16/syntax-vs-grammar-the-differences-and-similarities/. Accessed 25 Sept 2018. "What Are Specific Examples That Show The Difference Between "Grammar" And "Syntax"? | Socratic". Socratic.Org, 2018, https://socratic.org/questions/what-are-specific-examples-that-show-the-difference-between-grammar-and-syntax. Accessed 25 Sept 2018.